I’m used to being stared at in Japan, but one hundred and fifteen senior citizens all staring at me at once is a new experience to be honest. That they were expecting a speech from me was all the stranger. Yet, there I was in front of a collection of silver haired, wrinkle faced, smiling and occasionally snoring faces about to have a one hour ramble on all things Japanese and British. I should perhaps clarify before people begin to think I make a habit of strolling into old folks homes and regaling a room full of pensioners with tales from a long dead empire. I’d actually been hired to do this as part of the usual rent-a-gaijin service my employers run, ‘Need a pale faced young man from rainier shores to promote your local service? We have your gaijin.’ There’s no harm in it, usually they just want someone to write a few words in English on their service. I did just that for a local river rafting company; that I ended up wearing a traditional peasants hat and blue happi (essentially the top half of a heavy cotton kimono or yukata) and posing for a photo was sheer coincidence. This time however, I was stood at the front of a large meeting room on the third floor of the local government building and sharing my thoughts on weather, sport and food in Japan and Britain. The way it worked was that I’d reel off a short sentence or two and then a very nice English chap who’s been out here for many a year would translate my peculiar ramblings into much clearer Japanese. My nervousness in such events often translates in an infuriating way. I can speak perfectly clearly, but my hands will shake a fair bit. It’s certainly not as bad as it was when I was kid, a year or so of bartending and now teaching everyday means I’m pretty confident when it comes to holding the attention of a table full of people but it’d be fair to say that a hundred and fifteen people is outside my usual comfort zone. I started to ease into it all pretty quickly, even managing to get a few laughs when I mentioned how I became a Hiroshima Carp fan because supporting a winning team just doesn’t feel like… well like supporting a team really. Supporting England and Huddersfield Town is hardly the quick path to glory after all. Eventually we reached the question and answer portion of the event from which I hadn’t really expected too many surprises. This is after all a nation of infuriatingly polite people and as such not prone to asking difficult questions. Usually never straying beyond, ‘is this delicious?’ But I’d forgotten that I live in a country where the elderly rule and inappropriate questions come not from the mouths of cheeky teenagers but from brazen oldies. Militarism. Check. Nuclear weapons. Check. It’s quite fortunate that on these two topics I generally agree wholeheartedly with the Japanese otherwise I’d know what one hundred and fifteen disapproving old Japanese people sound like. Disappointingly I was asked the difference between England and Britain, some Japanese being blissfully unaware of the existence of Scottish people beyond scotch and the Welsh beyond… well they don’t know Wales is there really. Fortunately one man had some inkling of the construction of our Kingdom and asked me whether all the countries in the UK still hate each other. No of course not, I told him. They all hate England. Though when abroad, they just hate that no one seems to know that Scotland isn’t a prefecture of England. The ambassadors to the Court of St. James (Great Britain) and the United States of America had wagered a steak dinner on the outcome. The British had even made a vague and possibly ill-advised attempt at smack talk. Sledging, in the cricketing sense, we can do. American style smack talk, god no. It’s just not cricket. My American friend and I aimed a little lower to be honest. The largest plate of fries available in the somewhat grotty late night bar that would be showing the game at three thirty a.m. Japan time was our bet. Yet, thanks to Rob Green’s charitable howler in goal, we, much like the ambassadors, were forced to split the bill on our fries as they intend to do on their steak dinners. A goal keeping error forcing those of us who wagered on the result to go Dutch, when the Oranje had nothing to do with the game no less. Starving, the wagered fries were bought before the game even began, in what turned out to be a stroke of luck, as they were finished long before Green could tarnish them. By three a.m. the bar had pretty much emptied out. Only myself, my American friend and a long term British ex pat in Japan who happened to stroll in looking for a place to watch the game were in residence. A group of young Japanese men with annoyingly large hair were around for the first half, blocking sections of the screen with their tenderly coiffed locks. Yet again though, this was good fortune as this merely spared me from seeing Aaron Lennon’s excuse for a cross. Soon after these guys left, the bar gained a few late night regulars, some of the hostesses from the local snack bars came for a drink and something to eat after their shift. Paying little attention to the football unless the lone yank or myself rose to our feet and then collapsed back down onto the sofa lamenting the poor efforts of our respective teams. Though this being Japan they did become markedly more interested when David Beckham made fleeting appearances on screen, decked out in Marks and Spencer’s grey, looking, ‘Kakouii desu ne!’ or, ‘Good looking isn’t he!’ Compared to what was on the pitch, I was forced to agree. Unless of course it was Rooney in all his potato headed glory. All the while, one of the bartenders, clearly exhausted after a long shift, had curled up on the sofas like a cat next to the hostess girls. Sleeping quite soundly through the cacophony of English swearing and accusations of pre-marital birth aimed at Shaun Wright Phillips. As the match finished and I walked outside to begin my wander home I was once again confronted with reality’s harsh light; it was morning and England still aren’t up to much. At least the fries were good. What you aren’t prepared for, after the initial wave of culture shock has subsided and you have begun to settle down in Japan, is how much you become like the people who stare at you in this most homogenous of lands. The kanji (Chinese characters) that make up all the signs seem less intimidating, even if they make no more sense. The strange game boy like pop music that erupts at midday from speakers littered across town no longer makes you feel like you’re about to run head first into a Pokémon and you’ve even stopped converting yen into pounds. But what you’re not prepared for is that you will begin to stare too. Not at the odd intricacies of life in the far east of which there are plenty, not at the random items of food you cannot even begin to identify, but at something quite similar to yourself; the other foreigners. First you become more immune to the occasional whispering of (or downright yelling), ‘Gaijin da!’ Which can be translated roughly as, ‘Holy crap! Look, look, it’s a foreigner!’ However, the far, far more regular occurrence is staring. People in passing cars, folks in the supermarket, everyone in whatever bar you’ve just walked into will stare at you, or perform what they consider to be a surreptitious glance. Then it happens to you. Walking along the street, minding your own business until another foreigner rolls into view and you find yourself doing pretty much everything other than shouting, ‘Gaijin da!’ It’s awkward for both of you really, because you’re both attempting the same surreptitious glance. Still just occasionally this sense of shock that one’s own pale skin can induce in others has its perks. I had just finished teaching a lesson when the mother of one my students took her other kid, a one-year-old boy, of off her little backpack contraption as he was crying his eyes out. Once she had laid him down for only an instant on the desk to fix his little jumpsuit thing he stopped crying immediately. His eyes were wide, quite bewildered and fixed firmly upon me. I smiled and looked back, ‘Gaijin da.’ I said. With rapidly burning arms in the hot Shizuoka sunshine I was beginning to look like the archetypal British tourist abroad. Towel draped over my neck and beginning to turn a medium rare pink on every inch of my body exposed to the midday sun. Just to complete the stereotype of a hooligan Brit abroad I was shouting at the football. Now before you think I’d somehow discovered a Red Lion pub in Eastern Japan and draped myself in a white napkin knotted at the corners I should point out that I was in fact attending my first Japanese football match (Júbilo Iwata v. Kobe Vissel), the towel was the Japanese equivalent of a football scarf and… ok the sunburn I can’t defend. Last weekend, with an adult student of mine acting as my guide I ventured out to my first, though hopefully not my last, Japanese football match. 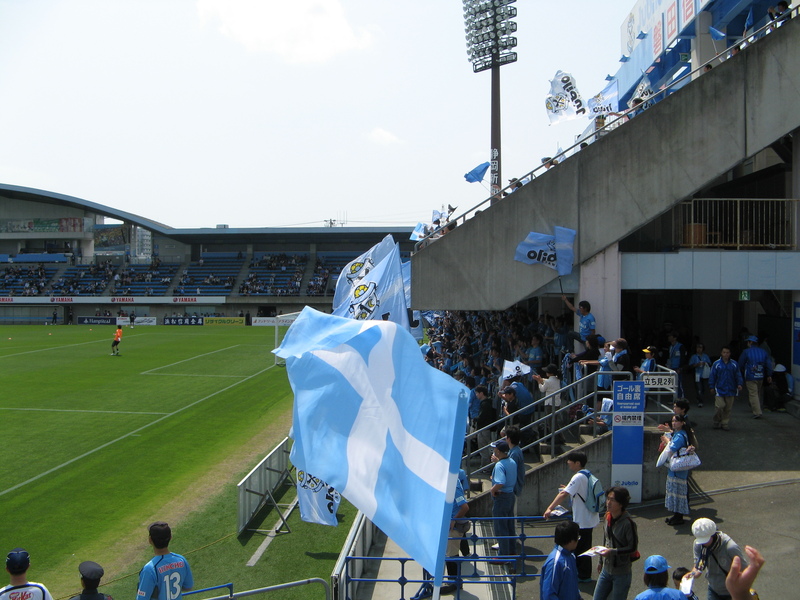 An eight hour round trip to Iwata in Shizuoka prefecture the cost of getting the fix of live football that has been sadly absent from my life since I left Britain’s shores last year. As I noted in the Hiroshima Carp post a while back, Japanese fans are crazy and I love them for it. Their enthusiasm is simply boundless. The players arrived for their warm up around twenty minutes before kick off and the fans immediately burst into a full throated round of songs and chants declaring their love for every player and all things Júbilo Iwata. This is also probably one of the few places in Japan beyond Tokyo and the port cities where internationalism is clearly visible. To begin with Júbilo is Portuguese for, ‘exultation’ while the score board declared, ‘Forza Júbilo !’ A frankly wonderful declaration of support for a Japanese team using a mix of Italian and Portuguese that I guess means, ‘forward exultation’. Frankly I’d march to that, nevermind bounce on the terraces. Inevitably though, when the goals did come it wasn’t from a Japanese boot. This is a country seemingly socially incapable of producing a striker. The team ethic is so well honed and drilled in children from such a young age that the creativity, individuality and downright selfishness required to be a decent striker doesn’t exist. So like any other nation in the world, they brought in some Brazilians to do it for them. The goals in this game came from the boot of one Gilsinho, his first a sublime effort after cutting in from the left wing and his second a neat finish after some chaos in the box. You can find the match report here. As the final whistle blew I waited for the anticipated rush from the stadium that so characterizes the end of English football matches, that mad dash to the car in an often ill-fated attempt to avoid the traffic. Yet it never materialized. No mad rush, but instead half the stadium gathering as close to the pitch as they could get as the players took a long stroll around the pitch to thank the fans. A more appreciative group of fans would be really hard to find. So, a hint of carnival, kids running around and my twenty five year old student screaming like a demented toddler who thinks he’s just spotted Santa coming down the chimney in an attempt to catch the attention of his favourite player. It’s no cold day at the Galpharm but it’ll do nicely for now.